After the huge success of the new Spohn Ranch bowl at Ocean City, the second stop of the 2011 Dew Bowl is taking over the Rose Quarter of Portland, Oregon. For the seventh consecutive year this weekend (August 11-14), the biggest names in skate will be returning to compete in Street, Bowl and the Alli RideShop Legends Jam, a bowl contest exclusive to the Portland stop. There will be a newly designed concrete course for this season’s Skate Street (see pic on the left). Paul Rodriguez will bring his smooth style to the contest, hoping to top Greg Lutzka, whose technical flips and grinds almost won him the 2010 Dew Cup. Ryan Decenzo is no stranger to success in Portland, winning the 2009 Best Trick contest. Theotis Beasley, Ronnie Creager, Dennis Busenitz, Clint Peterson and more round out the competition on the street course. pull apart and transport to Portland. It’s hard to believe for me, I never actually heard about this kind of thing. 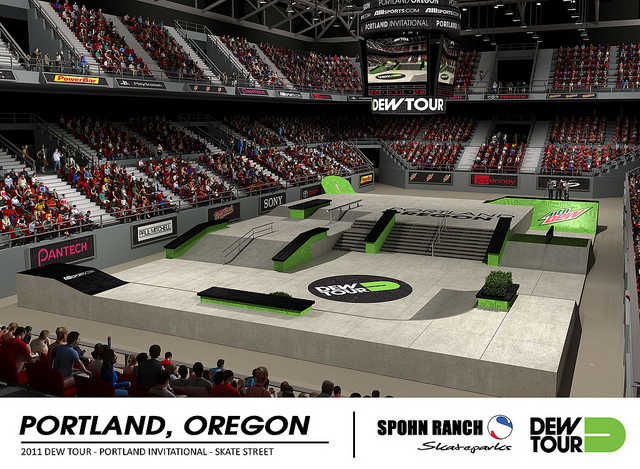 But the major event of the week end will be the second stop for the huge portable concrete bowl: the inaugural season of the Dew Tour’s Skate Bowl competition hits Portland after its huge success in Ocean City. Not often seen on the skate contest circuit, the full-concrete bowl gives spectators a front row seat to see the bags of tricks, 540, varials and coping grinds of both well-known names and up-and-coming skaters. The bowl, designed by skate legend Chris Miller in association with Spohn Ranch, is the same as the one already used at Ocean City. This bowl has already been described as the 7th wonder of skateboarding. 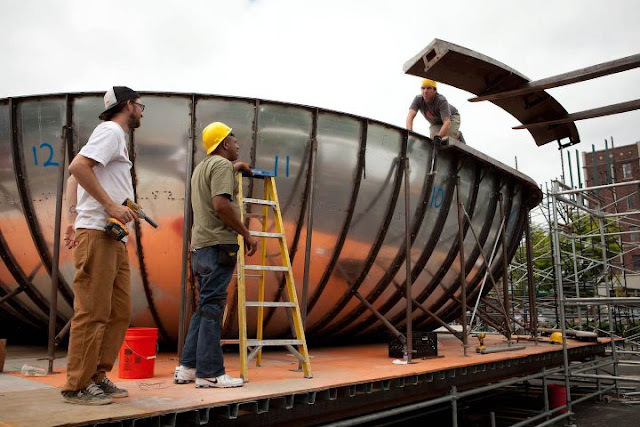 Completely portable, the bowl has a layer of concrete covering a metal structure and is cut by laser. Check the photos of the bowl being assembled on the left. At Ocean City, skaters loved the bowl, especially someone like Bucky Lasek who said that "This bowl totally blows me away that it’s portable and the fact that they have it on the beach is amazing. It totally skates like a permanent bowl. It doesn’t feel like it’s a portable structure.” Bucky Lasek, who landed 1st on the ramp at the last Dew Tour in Ocean City added: ” I think it also shows that the Dew Tour is stepping it up and really looking at where our sport is going, the future of the sport and progression. Bowl skating is definitely where it’s going." "I think it’s really good. I didn’t even know it was temporary when I saw it, I thought it was just a bunch of wasted concrete. Someone like Steve Caballero, who has been skating bowl for the past 25 years is as unapologetic as Bucky: "I think that this new element of the bowl is representing the bowl skaters and the bowl terrain at its legitimacy, as far as pool coping, all cement and not having any street element to it.” Cab said to Alli. He added that “That’s what I like about it. It flows really well. Chris Miller designed a really good bowl and I think everyone’s enjoying it." 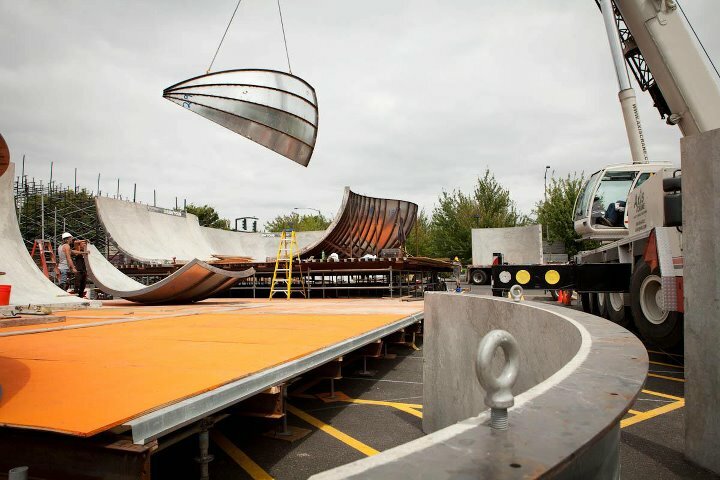 The world's first portable concrete skate bowl being assembled for the Dew Tour Portland Invitational. and Portland native Kevin Kowalski, as they measure their skills against the experience of masters like Steve Caballero, Andy MacDonald, Bucky Lasek and Lance Mountain. In addition to action-packed competitions, Sunday night’s Skate Bowl Final will be preceded by the Alli RideShop Legends Jam, a skate bowl event that promises to bring the big names of old-school skateboarding out to show off the skills that made the sport what it is today. The weekend will also feature a Friday night concert headlined by Green Label Sound Artist The Cool Kids. The show will be opened by West Coast rap group Pac Div. Adjacent to the contest, jcpenney is providing Portland with a once-in-a-lifetime opportunity to “Ride with the Pros” at the 2011 Dew Tour! In order to be eligible skaters must sign up at the Washington Square Mall jcpenney store on Saturday, August 6th. The first 80 skaters who sign up will participate in the Best Trick Contest; receive a VIP access behind-the-scenes tour of the Dew grounds and two free general admission tickets. They will then have the chance to skate on the official Dew Tour competition course with professional Dew Tour athletes August 11-14.